It seems that lately, many decisions to run certain races have been focused on 2 factors: 1) how much fun can we have with friends and 2) location, location, location. Ray Miller 50K satisfied those requirements in a big way. So off to LA we went. Hal and Carly picked us up from LAX and to my disapointment did not have a minivan and a six pack of Stella as requested since it worked so well in Hawaii just a month prior. But nonetheless, we knew it was going to be a good weekend- sunny LA, warm temps and a whole day of hanging out with no real agenda. We grabbed a quick bite and proceeded to do a little Hollywood reminscing by driving to our former Hollywood Hills home and then taking a quick tour of the Hollywood Resevoir before heading off to the pre-Oscar madness assembling over at Hollywood and Highland shopping area. We finally found ourselves in need of a reprieve of crazy tourists and so clearly the decision was – drinks at the Tropicana Bar at the Roosevelt Hotel. All four of us were running the following day and so we took it easy only alllowing ourselves one (strong) cocktail sitting poolside at the Roosevelt. A masquerade of actor types and hotel guests allowed us to distract our racing nerves with good old fashioned people watching. Finally we decided we had better get ourselves out of the spectacle and into a more appropriate place conducive for pre-race preparations. So after some driving we ended up at Chipotle in the valley and meal 3 of 4 for the day commenced. Finally night was upon us, a very enjoyable day had by all and it was time to get some sleep for the early wake up call. After a great night of sleep, an iced espresso, Vespa and oatmeal for breakfast, we made our way to the start in Pt. Mugu. In usual fashion we arrived just in time to tie our laces, say our hellos to friends Jimmy Dean and Kate Freeman and line up for the 6:00am start. My plan was to run with and ahead of most all the ladies to test this early season fitness- super fasties Amy Sproston, Shawna Tompkins and Meghan Arborgast were in the 50mile race and so I thought I should at least hang with them and probably even be in front of them considering I was running 19 miles less than they. So the fact that Amy passed me only about 3 miles into the race tells you what incredible shape she is in right now. She had a great race and won in a smoking time of 8:09 I think. JB and I just ran together all day. Mile 0-10 were warm up miles, me dealing with a yucky stomach, popping immodium like candy and finally relaxing enough to look around me and enjoy cool temps, very runnable climbs and good conversations with Jimmy Dean and others. Miles 10-20 brought the realization that I had better start running if I was going to keep my lead as I could see the other ladies behind me a bit coming into the climb at Hell Hill at mile 11. Miles 20-31 were actually my favorite- I finally felt like we were in a groove, pace was good, the climbs kept coming and my stomach had recovered somewhat. JB and I enjoyed each other’s company and I was seriously impressed that he stuck with me all day considering he is just getting back his fitness after a good 6 month break due to finishing “Unbreakable.” What’s nice is that after all these years and miles together, we didn’t feel the need to talk much or check in all that often with one another. Because we are so crazy busy, having hours togther on the trail is bascially our date night equivalent. It’s just good to share that time. I, of course, thought lots about Eva and lots about my aunt Patricia, who was just diagnosed with Stage 4 lung cancer at age 49. When I was struggling up climbs, these two ladies occupied my mind, prompting me to push a little harder. 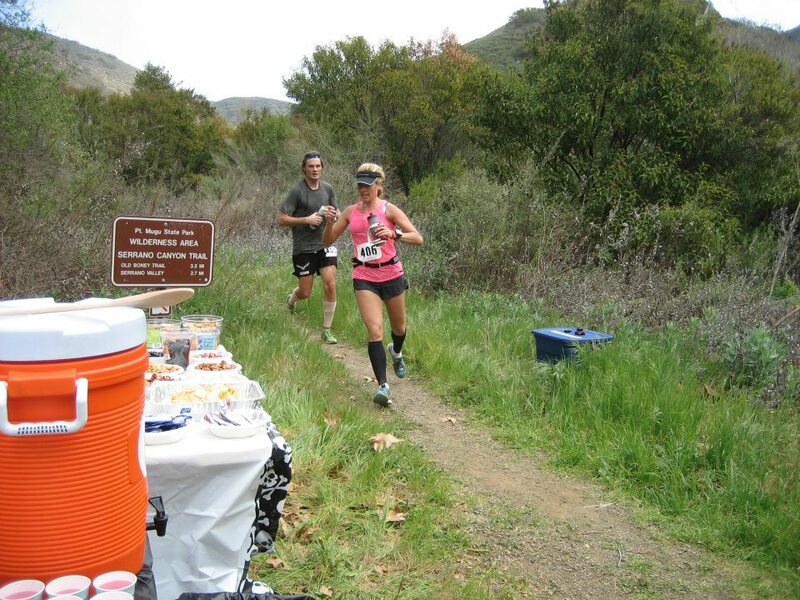 Coming into the last aid station at mile 26.5, I grabbed a quick gel and just kept rolling. One last big climb was ahead of us and I wanted to really push it. I ran most of the 1000 foot climb and could see I was gaining on JB. I didn’t wait for him as I didn’t want any last minute suprises. Cresting the top of the climb at mile 28.5, I could see JB was trying to catch up and we began a glorious 3.5 mile decent on the Ray Miller trail into the finish. Views of the Pacific Ocean were as good as barn fever and crossing that finish line was fantastic. 4:52 and 1st woman, 6th overall and a finish with JB who had to manage 5:30 pace on the way down to catch up with me. Nice event for sure- Keira did a great job with this race. It was a really tough course with about 6100 ft of climbing and an equal amount of decent. I think it will quickly become a popular and sought out event for years to come. Jenna, congratulations! Love your report and am inspired at how you balance it all with such beauty all around. Excited to watch your WS100M run in June. Thanks Ronda! Best of luck to you- Umstead soon right? Go get em girl! What a fun and inspiring report! Congrats on your win. I love that you can crank out a sub-5-hour winning time in spite of a strong drink the night before and crappy stomach the first 10 miles. This really makes me want to return to my SoCal roots and run this sometime. Nice job, Jen! 4:52 with that much elevation gain? That’s smokin! Especially for this early in the season. Sounds like a fun weekend all around. Keira does do a great job with her events, doesn’t she? Congrats to you and JB both! Thanks Gretchen! 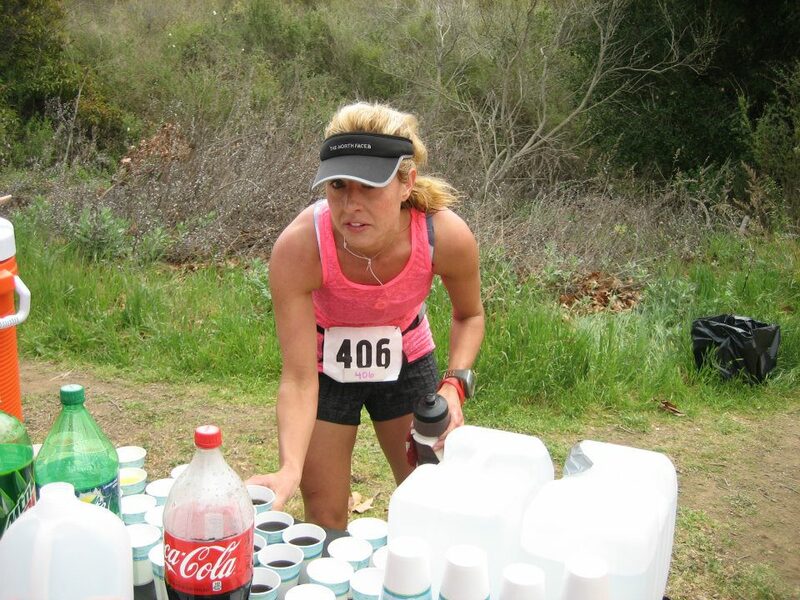 And might I also congratulate you on a fast Napa marathon…fun course isn’t it! !